Application that allows you to construct labyrinths, inspired by levels from the classic Pac-Man. Created boards can be shared with other players, tested, and set point records on them. 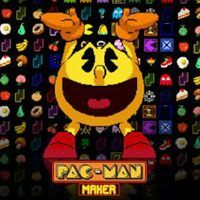 PAC-MAN Maker is a special edition of the cult brand, being in fact an editor of pac-man levels created with the biggest fans of the yellow hero in mind. The application was developed by the European branch of Bandai Namco Entertainment in cooperation with the Pixowl studio, known, among others, from The Sandbox Evolution. It is distributed as a free demo, which can be upgraded to a paid full version at any time. Fun in PAC-MAN Maker boils down to constructing pac-man's labyrinths - both small and not particularly complicated, as well as huge, of various shapes. The player has at his disposal all the classic elements of the boards (e.g. power-ups, so called Pellets, point bonuses, tunnels), as well as a lot of new ones, which appeared only in later versions of the cycle (e.g. teleports). There were also indispensable souls with different properties. In total, they come in eight versions, four of which are well known from the original Pac-Man (Blinky, Pinky, Inky, Clyde), and the others are their variation (Spunky, Sue, Funky, Punky). Designed labyrinths can be shared with other players. Nothing stands in the way of checking the boards in action, evaluating them and even setting a point record on them. The best results are recorded in online rankings, which can be accessed by all members of the community. Visually, the title is closer to the classic, automatic Pac-Man from the 1980s rather than the more modern editions of the series Pac-Man Championship at the forefront. However, the old-school style fits in with the retro boom moblins, and a large number of different decorative elements and backgrounds (you can beautify them by creating pixel-art graphics) allows you to look at the whole with a more gracious eye. The biggest fans of Pac-Man should be pleased to enrich the soundtrack with 10 previously unheard of remixes of the original background music.